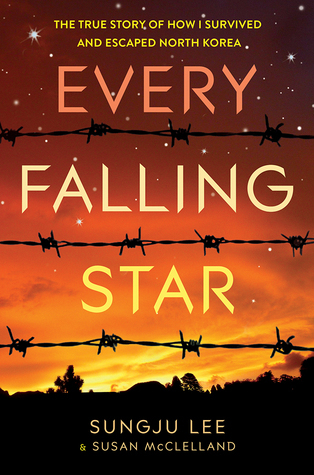 Summary: Every Falling Star, the first book to portray contemporary North Korea to a young audience, is the intense memoir of a North Korean boy named Sungju who is forced at age twelve to live on the streets and fend for himself. To survive, Sungju creates a gang and lives by thieving, fighting, begging, and stealing rides on cargo trains. Sungju richly re-creates his scabrous story, depicting what it was like for a boy alone to create a new family with his gang, his “brothers”; to be hungry and to fear arrest, imprisonment, and even execution. This riveting memoir allows young readers to learn about other cultures where freedoms they take for granted do not exist. Review: Every Falling Star is a compelling and intimate look at Sungju Lee’s life in North Korea when his family falls out of favor with the government. This is a personal story, and as such, it doesn’t have a wide-angled view on North Korean politics and history, which means that teens who aren’t familiar with the late 1990s/early 2000s history of the country may find themselves a little disoriented from time to time. Every Falling Star is, instead, the story of a child whose well-off parents tell him they are going on vacation only to slowly discover that his old life isn’t something he can ever return to. The book spans several years, from childhood to mid-teens. While the traveling-then-fighting-then-traveling-again sections can become repetitive, the tight focus on survival and the camaraderie between Sungju and his fellow homeless gang members generally keeps the story moving at a good pace. Lee does an excellent job anchoring the reader with sensory details throughout the book, from describing what extreme hunger feels like to the conditions of a prison/detention center. He also takes the time to explore the good moments, and the frequent circling back to hope and friendship helps prevent the reader from becoming desensitized to what can be a brutal story. Lee and his fellow kotjebi (homeless kids) do whatever they can to survive, from stealing from marketplaces and government farms to fighting other child gangs to performing in the streets for money. Their tight-knit group helps keep everyone alive, as best they can, though they are not always successful. I particularly enjoyed following Lee’s shifts in thinking about his country and his life through the progression of the book. The struggle for him to reconcile what he has been taught his country is like with what he begins to experience can be heartbreaking at times, such as his decision to drop out of school and begin helping his family full-time in foraging for food. Lee takes what useful things he can from his old life—particularly military stories and even his taekwondo lessons—and repurposes them to help his group. While I have a few minor quibbles here and there, my biggest disappointment is the rather abrupt ending. Even with the epilogue, which sketches out some information about Lee’s life after he left North Korea, it feels rather thin and inadequate after such an in-depth look at this period of his life. Some of this is undoubtedly due to Lee’s caution in revealing too much information about his family—for example, he finally learned what it is his father did to fall out of favor with the government but cannot share those details without fear of possible reprisals against what relatives remain in the country—but it actually left me concerned for a few moments that my ARC hadn’t downloaded correctly. I would have appreciated seeing more of the aftermath of Lee’s escape, but the narrative essentially cuts off once he reunites with a family member. Recommendation: Get it soon, particularly if you enjoy memoirs. The compelling narrative and evocative descriptions make this an relatively quick read, though you may find yourself putting the book down occasionally in order to recollect yourself. My daughter studied in Seoul for a year and moved there two years ago. She was involved with a group that met once a month with teenagers who escaped North Korea. They were not allowed to discuss anything about North Korea, their escape route, where they lived now, etc., because it could endanger family or friends back home. As you suspected, that’s probably why the epilogue is light on details. I look forward to reading this–thanks for the review!